Chad Nolan Ward, Jr. hails from a long line of forestry workers. The Union County resident and University of Florida student says the profession is in his blood. Now his dreams have become easier, thanks to the Roland T. Stern Endowment Scholarship at UF. Roland T. Stern was a beloved family man and forester from Lake City, Florida. After Stern passed in January 2017 his wife, Lucinda Stern, created the Roland T. Stern Endowment at the University of Florida to memorialize his legacy and create opportunities for the next generation of foresters. 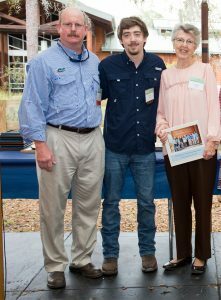 Terrell “Red” Baker, director of the UF/IFAS School of Forest Resources and Conservation, Chad Nolan Ward, Jr and Lucinda Stern. This endowment not only provides funding to sustain educational opportunities at the UF/IFAS Austin Cary Forest, but also offers scholarships to forestry graduate and undergraduate students from Bradford, Union, Baker and Columbia counties. The first recipient of the undergraduate scholarship award, Ward, is a rising senior in the UF/IFAS College of Agricultural and Life Sciences studying forest resources and conservation. Prior to attending UF, Ward earned his associate’s degree from Florida Gateway College in Lake City. He is now specializing in forest business management in the UF/IFAS School of Forest Resources and Conservation. Ward thinks his forestry education will set him up for success, whether he continues to work for the family business or chooses to work for a larger, land-owning corporation. He said he appreciates the Sterns immensely for helping him pursue his degree.